Metro’s On the Move Riders Program is a peer-to-peer travel training program designed to educate older adults on the basics of riding public transportation. In the process of learning to ride, participants travel to destinations throughout L.A. County. They are led by volunteers called Travel Buddies, older adults who are already experts at navigating bus and rail transit. There are currently 46 Travel Buddies who lead 26 clubs throughout the county. On the Move Riders recently partnered with the AARP to provide travel training to its members. 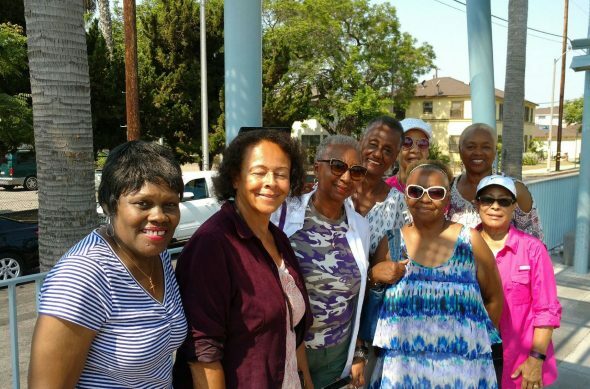 One of the local AARP membership clubs took their first group trip in July to visit Union Station via the Expo Line. They traveled from the Expo/Crenshaw Station to 7th/Metro Center, then transferred to the subway to reach Union Station. The group was led by Travel Buddy Marilyn Peters, who has been riding Metro for years. While trip destinations are decided by a group vote, Marilyn reports there has already been high interest in visiting Santa Monica — and she’s looking forward to planning that trip. Riders who are 62 and older are eligible for discounted Metro fares if using a Senior TAP card. Click here for information on how to apply. For more information on how to join the On the Move Riders Program, call 213.922.2299 or email OntheMove@metro.net. UPDATE: Red/Purple Line resuming regular service with delays thru 6 p.m.